Grozny, Oct. 7 (BNA): HH Major Shaikh Khalid bin Hamad Al Khalifa, Royal Guard Special Force Commander, visited the Akhmat MMA Club on the sidelines of his visit to the Chechen Republic at the invitation of President Ramzan Akhmadovich Kadyrov to attend celebrations on the 200th anniversary of the establishment of the city Grozny. HH Shaikh Khalid met the President and members of the club, who introduced in detail the programmes offered by the club and the events organised, the most prominent being the World Fighting Championship Akhmat (WFCA), which witnessed its 53rd edition last Thursday with the participation of professional players from around the world. HH Shaikh Khalid praised the levels of the participants who showcased their abilities and combat potential and achieved good results in this event. 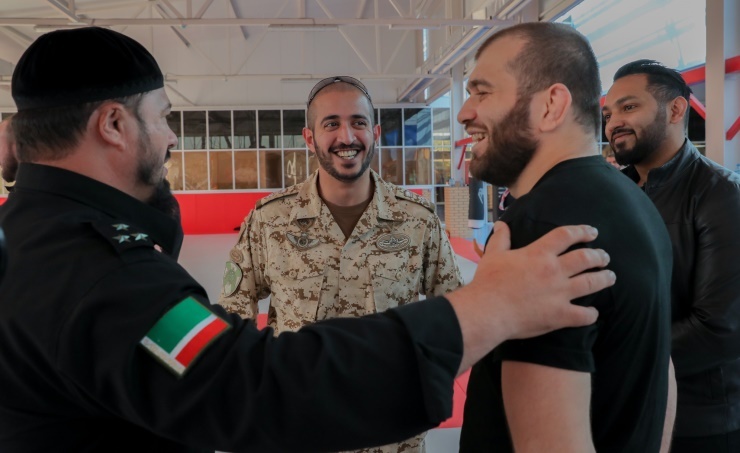 HH Shaikh Khalid affirmed that the Chechen Republic is one of the countries that have contributed to the promotion of mixed martial arts at continental and international levels, through the steps taken to spread this sport in the Chechen sports community and encourage Chechen youth to practice it. This has led to the emergence of distinguished players in this sport. "The Kingdom of Bahrain and the Chechen Republic have a unique experience in the field of mixed martial arts. I believe that this experience has contributed to the development and advancement of this sport. There is an opportunity to strengthen cooperation frameworks in this sport to raise the overall level of this sport in both countries," HH said, wishing Chechnya more success in this sport.